In short, I have to use pancake boxes. Surface mounting pancake boxes and trying to hide them under a fixture is pretty brutal. And unless the fixture has a stamped cubic inch number inside it, I don't think its NEC that you can stuff more than one 14/2 wire in there. 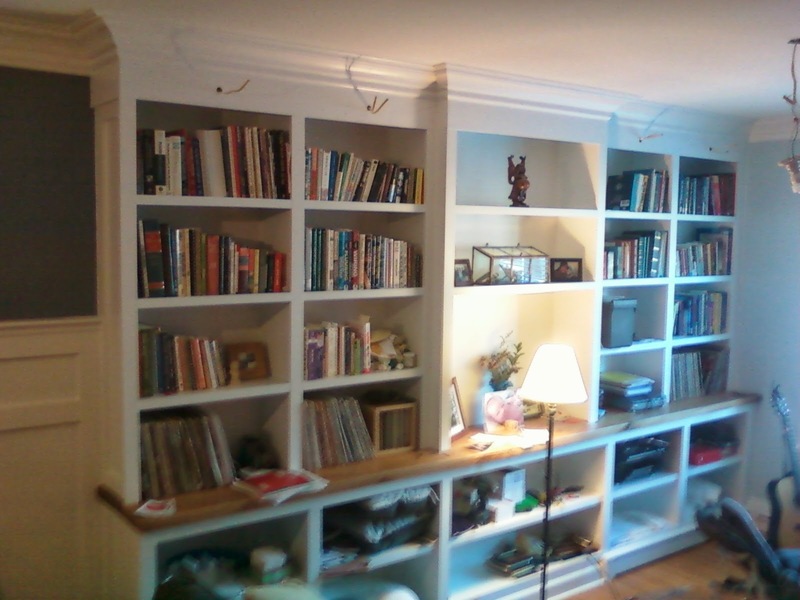 All of mine are 12/2, and I also have two wires for three of the bookcases (they are daisy chained). What's the solution? Fire up the router and plunge in 1/2" and try not to hit the romex. The best way to do this is clamping a template to the frieze so that I can use a top-bearing flush cut router bit to trade out the 1/2" crater. Its going to mess and hard (I have a cabinet grader router.. its 19 lbs). Fun! Let's move to the layout. Now, set up a super ghetto work station out on the back slab. All my sawhorses are spoken for doing other tasks lately. That's it. Now I just freehand the routing. I waste about 1/8" of wood on each pass. I'm simply using some 3/4" PPFJ because its what I had laying around and it was a good size for the task. Test fit. Drops right through. Perfect. Its hard to show in the picture, but this hole is less than a 1/16" of play on all sides. The fixture I want to use has basically zero tolerance. Let's test all four, because I don't trust that these terrible made pieces of junk are the same size. Next up, routing the bookcase. Ugh.